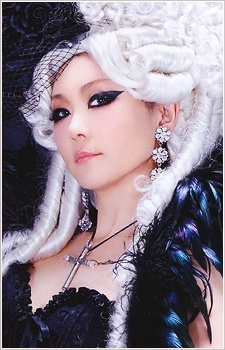 ALI PROJECT is a Japanese band with a strong Japanese Aristocrat-style image, consisting of Arika Takarano (宝野アリカ) (vocals & lyrics) and Mikiya Katakura (片倉三起也) (music & arrangement). In the band's earlier days, their musical style tended towards light, cheerful and/or refreshing songs. However, the sound has changed in recent times to take on a darker and more mysterious tone. Takarano Arika, lead singer/lyricist, has termed this change as a transition from White Alice (白アリ) to Black Alice (黒アリ). Though there has been a general shift towards performing songs in the "Black Alice" phase, Ali Project has occasionally sung in the White Alice style as well. They made their indie debut in the charts in 1988 as Ari (Ant) Project (蟻プロジェクト) with their album Fantastic Garden (幻想庭園 Gensou Teien). The album was later included in Tatsumi Takayuki's book Philosophy of Progressive Rock (プログレッシヴ・ロックの哲学), which led to the band being classified under the progressive rock genre. Four years later in 1992 they changed their name and made their major debut with their single Fall in love, maiden (恋せよ乙女, Koiseyo Otome). Most of their records are released by Toshiba-EMI, Victor Entertainment and Tokuma Japan. The band is notable in the anime community for having their songs featured in several anime opening and ending sequences, most notably the series Noir and Rozen Maiden. Katana to Saya is a masterpiece! ED1 of code geass R1 and E2 of code geass R2 are pretty good. Their style and themes really appeal to me, I like them a lot. I think it's pretty hard to find the correct visuals and editing to match with their songs; Rozen Maiden, Maria-sama, Noir and maybe Another and Katanagatari make a good work in my opinion. Wow, I hate literally everything they've done.